Valerie is renowned for providing exceptional levels of service and professionalism as well as being nationally recognised as a leader in advanced skincare and laser hair removal. 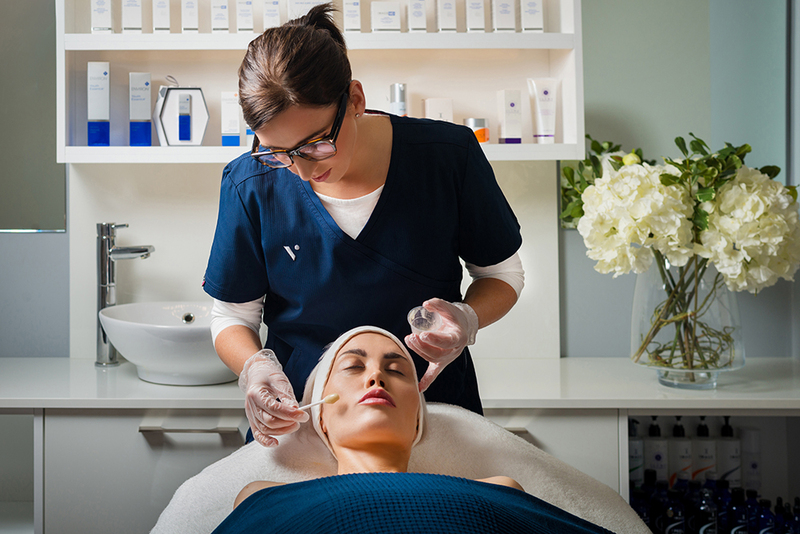 Valerie prides herself on using state of the art equipment and work with some of the best skincare brands in the industry. AlumierMD Professional Peel Treatments are the next generation of clinical exfoliation. With a variety of peels, each with a unique complex of ingredients, we can customise your program of treatments to target your specific skin concerns whether it be aging, pigmentation or acne. This unique experience includes an exfoliating peel treatment, brightening enhancement followed by prescriptive targets serums with reveal a more radiant, soft and luminous skin. A customised AlumierMD Professional Peel costs €98 – €120. With lactic and salicylic acid, radiant 20/10 is a powerful resurfacing peel which improves skin tone and texture by exfoliating dead skin cells and speeding cell turnover. This multipurpose resurfacing peel reduces acne pimples and minimizes the appearance of fine lines and wrinkles, large pores, hyper-pigmentation and sun damage. This is facial is a luxurious experience that combines relaxation with high performing active ingredients to address your skin concerns. Each facial is customised to suit your skin needs, leaving you beautiful radiant looking skin, feeling relaxed and balanced. A peeling treatment is designed to improve and enhance the skin. Its benefits include skin clarity, even skin tone, uniform colour and improved texture. We offer a variety of different peeling solutions for various skin conditions including acne, aging, sun damaged, rosacea or hyper pigmentation. Your aesthetician will choose the most suitable treatment for you following your consultation. We have sourced the highest grade cosmeceutical range of Peels and Post Care Products from the USA – Image Skincare. This lightening treatment gently blends lactic acid and a cocktail of lightening and brightening agents to reduce sun spots, brown spots and the redness caused by rosacea. A consultation a pre-treatment is required for this treatment. Book in with our Advanced Skincare Specialist Valerie Osborne to learn more. As part of your treatment program you will receive a complete skin analysis and homecare routine. You will also receive an IMAGE Skincare Kit to use at home worth €18 after each treatment. This kit contains a week’s supply of products to use post peel. A Course of 4 Skincare Peels is recommended – receive a 20% discount when you purchase your course of 4 and pay in full. SkinCeuticals products are backed by science from the first stages of their development through the packaging of the final formulations. Extensive medical-grade clinical testing that proves their products’ efficacy sets SkinCeuticals apart from other cosmeceutical brands on the market. By combining a customized at-home regimen with powerful in-office treatments and targeted skincare solutions, the result is healthier, more youthful looking skin. A customised SkinCeutical gel peel gently exfoliates, hydrates and prepares the skin for deep fibroblast stimulation using IPL to increase collagen and elastin production. This treatment also targets pigmentation, uneven skin tone and diffuse redness to achieve a healthy even glowing complexion. We combine our Micro-needling with a prescriptive SkinCeutical facial treatment to address individual skincare needs and follow with a Dermalux LED Phototherapy treatment free of charge to reduce any downtime. A topical aesthetic is applied before needling to ensure our clients a completely pain free experience. The Expert Gel Peel GL Treatment contains a powerhouse of ingredients with Glycolic acid and Lactic acid. It’s specifically designed for sensitive skin to help restore radiance and brightness to dull, lack lustre skin experiencing dryness, mild discolouration, and rough texture. Combined with protective antioxidants this treatment will leave skin looking brighter, more radiant, and refreshed.